… an ‘Oscar’ for Isa/Aaron? It’s easy to forget that the often unsung heroes of virtual worlds are the builders – the on-the-virtual-ground developers, scripters, animators but especially the builders. As educators it should be easy for us to specify what we want – after all we’ve generally been giving similar lessons in real life – but then it is much more difficult for the developer-builder to turn one’s dreams into reality, especially if those dreams are just pie-in-the-sky impossibilities, conjured up by people with little experience or “immersion” in virtual worlds. However, the kudos for turning “impossible dreams” into some sort of reality, more often than not, goes to the publicity-conscious academics leading a programme rather than the builders and developers who toil, mostly anonymously, behind their screens, trying to meet impossible time and financial constraints, and who are then forgotten in the praise heaped on the successful project promoters. All educators, before they embark on the design of a learning opportunity in a virtual world, should clearly understand that content creation and development in virtual worlds is hard “yakka*”. They also should not forget that praise should go to the builder if a design works. The builders know only too well that if a project fails, they, the builders, will be blamed by the academics for its failure. Unlike the academics, however, most top-notch builders I have met have been loath to accept written praise or credit despite the fact that their livelihood often depends on them getting on-going work in virtual worlds. In the SLENZ Project we have one top-notch builder, Aaron Griffths (SL: Isa Goodman), of F/Xual Education Services (email: debnaar@clear dot net dot nz), who is the Lead Developer “genius” who has created the SLENZ Project’s foundation learning and midwifery pilot builds, scripts, textures, animations etc from what initially were little more than fuzzy ideas. Aided by developers/builders NMIT’s Dr Clare Atkins (SL: Arwenna Stardust), who doubles as the SLENZ Project’s co leader, and WelTech’s Todd Cochrane (SL: Toddles Lightworker) Aaron has created from scratch the builds which you can see on Kowhai today, on time and on budget. But let him tell you himself what it was like, even though I believe he would not want the limelight. Fortunately he has he described how it is in a letter to Metaverse Health, which in its otherwise well-intentioned and fulsome article on the SLENZ Project’s Midwifery Pilot promotional machinima, unfortunately gave no credits to the SLENZ Project builders. Answering criticism in a comment on the article, that a partner was not present in the midwifery birthing machinima, Aaron noted it had been intended to have a partner present but this had been finally precluded by having to meet deadlines and budget constraints. “Unfortunately in the end to meet the deadlines set by the fact the students were coming into the build on a specific date, the scripting, animations and building required to have a partner (of whatever gender) present in the scenarios just did not happen,” he said, before going on to describe the build and the work involved. “This (midwifery build) was a very complex build designed out of very little in terms of actual specifics, reassessed and recreated on an ongoing basis through discussion with the educators,” he said, by way of explanation. “The build was divided into stages so that at least, even if the ideal could not be developed within the budgeted hours, we would have finished stages at points throughout the process which could be considered complete resources. The finished Birth Centre … interior. “Stage one therefore gave us the actual unit, created as an immersive experience of an “ideal birthing unit” complete with notecards and links out to information supporting the theory associated with the design. “Stage two (which we have reached) … steps the midwife through a normal birthing process in terms of her interactions with the mother from the first phone call into the unit through to the actual birth. “The scenario goes beyond a simple role play of mother and midwife to include the numerous clinical requirements of the process such as blood pressure and temperature readings, preparation of medical equipment and medications, good practice requirements, e.g. use of sterile gloves in examination, washing of hands etc. “Stage three was intended to extend the scenarios to include not only a partner (or whanau depending on ethnic considerations) but more difficult births such as postpartum hemorrhage, i.e. birth scenarios typically not experienced by midwifery trainees. Finally to put some perspective on the task Aaron has completed with the midwifery pilot (all originals to allow for full permissions under a Creative Commons license) the build now has more than 2600 objects, more than 250 scripts, not including HUDs worn by the mother and midwife, 16 animations and poses, and more than 100 textures. 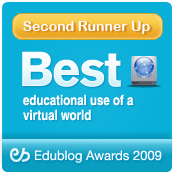 If there are Oscars for the creation of virtual world education builds, Aaron should be in line to get one for his midwifery pilot, if not for both his midwifery and foundation learning builds. The finished Birth Centre … exterior back. The finished Birth Centre … exterior front. … and Isa Goodman/Aaron Griffiths’ Foundation Learning build. *Yakka: Australian venacular for very hard work. Lead educator for the SLENZ Project’s Midwifery pilot for Otago Polytechnic and Canterbury’s CPIT, Sarah Stewart (SL: Petal Stransky) (pictured), after running her first teaching sessions in Second Life, has come up with nine interesting and valuable lessons for any neophyte virtual world teacher. 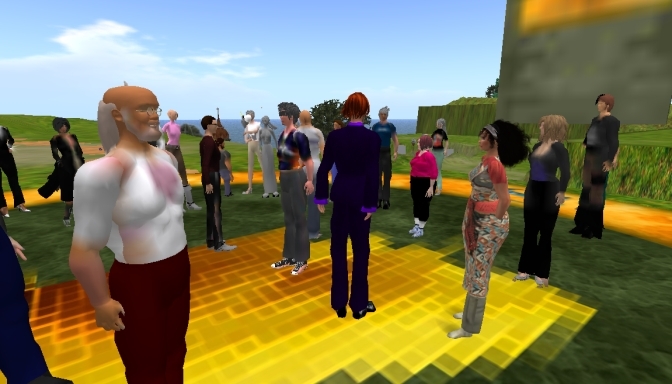 Although most seasoned Second Life educators will have already solved these the issues she raises they are worth thinking about again as one reads her blog, Sarah’s Musings. Stewart’s sessions were based on the second learning activity that has been designed for junior midwifery students as part of the SLENZ Project’s midwifery pilot. While reading Stewart’s blog its also worth while looking at her two explorations/ examinations of “birthing places” in Second Life, no matter how unrelated to real life some of those birthing places are and how whimsical they may be. The blogs are here and an earlier one, here.